A boiler is a closed vessel or container in which the fluid especially water is being heated. This heated water produces the steam and it is used to do useful work. Steam and the state of the steam vary on varying the temperature. Locomotive engine, is a self propelled vehicle. Locomotive boiler is the part of locomotive engine where the steam formation takes place to run the steam engine of the vehicle. Now days this vehicle is powered by the diesel or electricity. Prototypes of the steam locomotive were first developed in the Great Britain early 19th century and this investigation overcomes the railways problem. Railways used steam locomotive for railways transport until the middle of the 20th century. Locomotive engine has been used in the railway over long period of time. Locomotive boiler is a part of the locomotive engine which produces the steam. Coal is burn in the furnace that produces the high amount of heat and converts the water into steam. Now a days in the railway diesel engine is used because its efficiency is more than the steam engine. 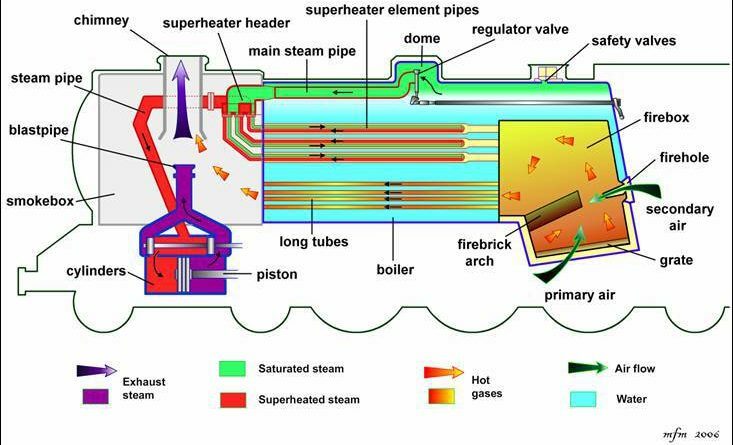 Locomotive boiler is a fire tube type boiler. Multi tube is involved in it; all the tubes are horizontally in the horizontally placed drum. It has 116 general fire tube and around 38 super heated fire tube. Furnace that produces heat over the burning of coal is located inside the boiler and hence it is an internally fired boiler. Locomotive boiler has high steam generation rate and is portable. It is also used in the marine sector. In this boiler so many components are involved. All the components are mention in the below figure. Here we will discuss the main components. It has the shell or barrel in which the fire tubes are placed. Shell is filled with water. Standard dimensions of this boiler are, shell diameter is 8.5 and length is 4m. A large space is provided on the top of the boiler called dome where the steam is being stored .when the boiler is in the working operation it produces large amount of steam. It is attached to the steam dome which is being regulated to adjust the inlet and the outlet of the steam to and from the steam dome. It is provided at the right end of the boiler as we know that the locomotive boiler used coal as fuel. Coal is a solid fuel it has to burn to produce flue gases. Coal is kept on the grate and the secondary air is supply to it on the burning of coal flue gases and ash formation take place. Ash gets settle down in the ash pit. There are mainly two types of pipe, one is used to flow the flue gases to make the saturation steam, Flue gases are passes through the fire tube which is surrounded by the water. Hot fire tube exchange the heat with water over the long heat exchange water becomes saturated steam and it is then supply to the steam dome. Another is used to make superheated steam and this steam is finally used for the engine. Fire brick arch is provided just above the grate to prevent the entry of the ash, dust particle into the fire tube. On the burning of the coal, coal particles get split into very tiny particles and accumulation of these particles may leads to severe problem. 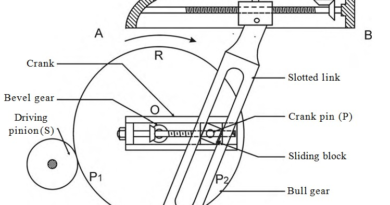 Safety valve is provided to maintain the steam pressure. It is also responsible for the blow off the steam when the steam pressure reaches beyond the safe working level. There are two types of steam pipes are involved one is saturated and another is superheated steam. Once the superheated steam used in the engine, exhaust steam is come out from the blast pipe. Blast pipe release the exhaust steam, on the releasing it help to the smoke to release into the environment through the chimneys and at the same time some amount of flue gases is being sucked by the blast pipe. It the outlet of the exhaust gases, but more particularly in this case the exhaust steam comes out of it once it is used. Hot flue gases contain smoke that needs to be expelled out to the atmosphere. To release these exhaust gases or smoke chimneys is provided. 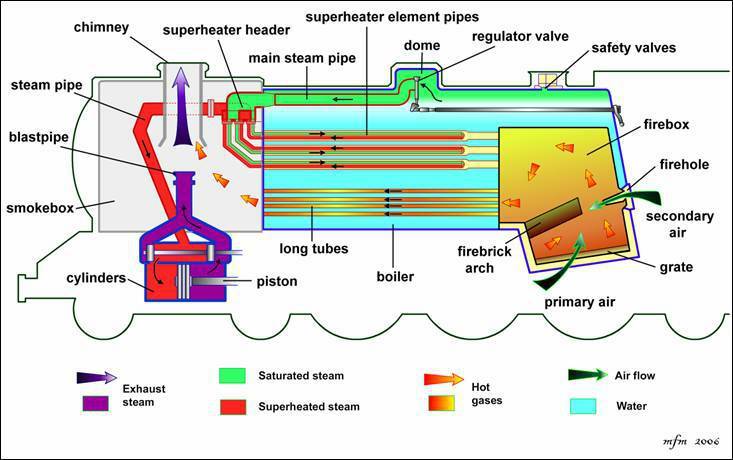 In the steam engine superheated steam is used so the exhaust gas will also be a steam only. Solid fuel, coal is burn on the grate which produces the heat in the form flue gases (hot gases). Flue gases is then passes through the fire tube pipe which surrounded by the water. Heated fire tube exchange the heat with water and make it saturated steam. Produced saturated steam is stored in the steam dome. This steam is not suitable to use in the engine because it contain some amount of water. Steam is drawn from the steam dome and passes through the superheated steam pipe where the saturation steam converted into the superheated steam by using the flue gases. Superheated steam is then supply to cylinder of the steam engine where the movement of the piston take place that propel the engine forward. Exhaust steam comes out from the blast pipe which pushes the smoke into the chimneys and release to the environment. At the time of pushing the smoke some amount of flue gases is being sucked by the blast pipe that also help to maintain the superheated level of the steam in the cylinder. It has high rate of evaporation somewhere 55 to 70 kg/Sec. Free from the brick boundary and external insulation that reduces the overall cost. It is portable, can be move from one place to other. Not suitable for high load due to overheating problem. Maximum steam pressure is limited to 20 bars. Leakage occurs at the joints that decreases the efficiency. Scale and corrosion formation occur. Locomotive boiler is mainly used in the railway to run the train engine. Efficiency of this steam engine is very less and limited so it no more used in the railway. It is also used in marine, traction engines, steam roller etc. This is all about locomotive boiler. If you have any query regarding this article, ask by commenting. If you like this article, don’t forget to share it on social networks. Subscribe our website for more informative articles. Thanks for reading it.